I like to think that I am the Boss, and of course that means I have Staff. Husband just smiles when I bring this up. He works endlessly on my garden whenever I ask, but make no mistake: I am not the Boss. This doesn’t stop me from trying to direct all activities, but even I know where I belong in the Universe. Next to Husband, always. Not above, not below, next to. 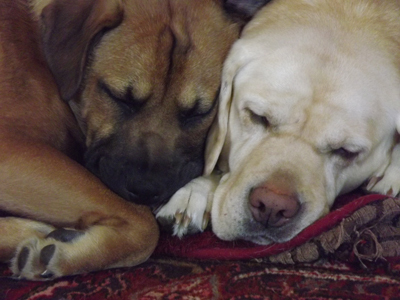 The dogs, however, are another story. 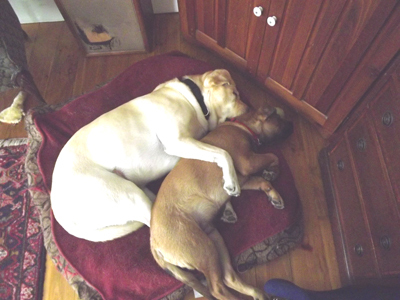 MacKenzie, the 5-year-old yellow Labrador Retriever, and Gordon, the 7-month-old brown mutt report directly to me. I can make them happy just by inviting them to sit within 30′ of me when I work in the garden, and I can break their hearts with a cross look. It is a power I wield gently and with great respect. MacKenzie is a gentle giant — 80 pounds of Soft. 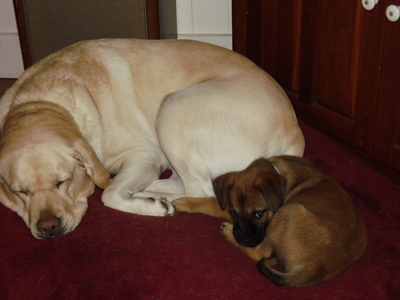 She is well past the puppy stage, and is settled. Enter Gordon. He rocketed into our lives last November, throwing himself across the room, jumping on MacKenzie’s head when she was sleeping, teething on anything — hands preferred. He does not stop. Puppies are tough. If you live through the first year, and parent consistently, you will have a lovely companion for life. Gordon is 7 months old, and we’re hanging on to that 1-year anniversary. He is a tough little guy. Still teething, still male, still hysterically happy, and now, incredibly strong. This is a challenge in every aspect of our lives, but it is a serious issue in my garden. I have learned where I draw the line, and trust me, the dogs know, too. 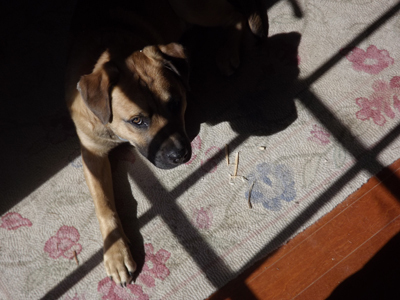 “Digging in Master-Mom’s Garden Is Grounds (ha) for Dismissal”: Gordon was almost fired when I turned around after a long dig in the garden, thinking he was quietly sleeping on the clean straw in the garden path. He was not. He was digging a hole approx. 1 foot deep in my beautiful, no-till, richly composted, bed-intended-for-tomatoes-not-dogs. 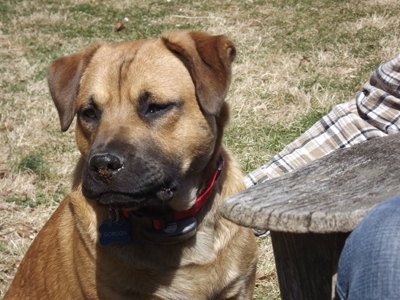 He was dismissed, muddy nose and all, to sit next to my son in the Adirondack Chairs. Outside the fence. Gordon was dismayed. MacKenzie has learned the No-Dig rule, but to be fair, she learned this years ago, at our other house, where I did not have my spectacular vegetable garden. The stakes have risen, and so has the risk to my staff. Gordon spent one hysterically happy morning (the only kind he knows how to have) tearing through the garden, breaking the string marking the beds, kicking up compost, and scattering tools. I kicked him out and incarcerated him in the house. He did not like being in jail. But now, my staff is trained. (I believe.) MacKenzie accepts the limits, and seems to understand that the garden is now off-limits. She probably doesn’t appreciate that I have seedlings emerging, but she does understand tone of voice and body language, and rarely asks to come in. 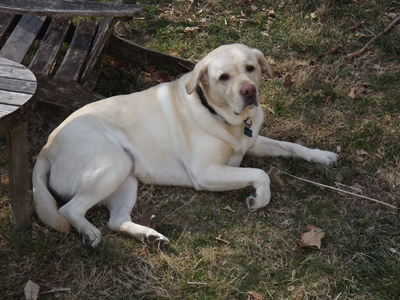 She lays down near the Adirondack chairs, or the garden fence (whichever is shadier) and is content to simply be near. I love that. Gordon has not accepted this new Rule for Employees. He lets me know, with the most tragic of faces, and the most plaintive of whines, that I have broken his heart. He wants to come in. And now you have been properly introduced to my Garden Staff, MacKenzie and Gordon. Lest you think I am an uncaring Boss, please know that they get vacations daily, sick days whenever requested, multiple lunch breaks, and free snacks almost on-demand. I pay them in love. And they pay me back. I have just used two giant bags of Dr. Earth to fill in the hole Prince Cherubino (Beans) dug as a cozy bed beneath the hydrangea bush in the only so-called off-limits flower bed on Bosky Acres. He is not too high up in Kohlberg’s Stages of Moral Development, still firmly in stage 1 — avoiding getting chewed out. What happens when I am not there concerns me greatly, because there’s no fence. Ideas? I wonder if he’s digging a bed to keep cool? 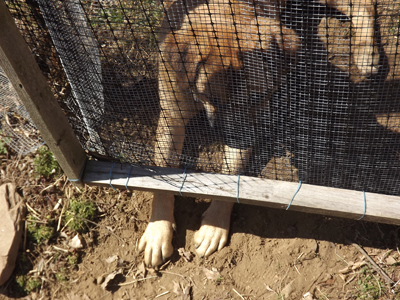 We tried a random piece of wire mesh to block off both dogs from our lily-of-the-valley bed, to no avail. It was “their” path into the house, so they just hopped over it, digging it up further as they leaped up and over. What about digging Beans his own cool-off bed and praise him when he’s in it? (I know. It’s a lame idea.) I will have to look up Kohlberg. Sounds like I could use the help!